The thrilling, bloody and glorious new novel, from the master of the epic tale, Tim Willocks, author of The Religion Paris, August 23rd, 1572 What do you do when your wife disappears In the middle of the bloodiest massacre in European history And you know she is about to give birth to your only child? Three wars of religion have turned Paris into a fetid cauldron of hatred, intrigue and corruption. The Royal Wedding, intended to heal the wounds, has served only to further poison the fanatics of either creed. But Carla could not have known that when she accepted an invitation to the ceremony. When Mattias Tannhauser rides into town, on Saint Bartholomew's Eve, his only intention is to find her and take her home. But as the massacre of tens of thousands of Huguenots begins, and the city plunges into anarchy, Carla is abducted by Grymonde, the grotesque gang leader of the Yards, and Tannhauser finds himself imprisoned in the Louvre, at the centre of a vicious conspiracy. Wanted by the law, the assassins' guild, and a militant army who call themselves the Pilgrims of Saint-Jacques, Tannhauser must rise to pitiless extremes even he has never known before. With no one to help him but a stable boy, he wades into a river of blood without knowing what lies on the other side. 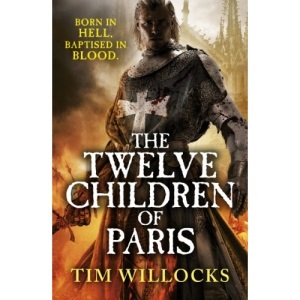 As he harrows Hell in search of his beloved His destiny is changed forever by The Twelve Children Of Paris... Tim Willocks is a novelist, screenwriter and producer. He was born in Cheshire in 1957 and has lived in London, Barcelona, Los Angeles, New York, Paris, County Kerry, and Rome. After qualifying as a doctor from University College Hospital Medical School, he went on to specialize in psychiatry and addiction. Translated into twenty languages, his novels include The Religion - the first novel to feature Mattias Tannhausaer - Bad City Blues, and Green River Rising. He has worked with major Hollywood directors, dined at the White House and holds a black belt in Shotokan karate. His new book, The Twelve Children of Paris, also featuring Tannhausaer, is set during the Saint Bartholomew's Day Massacre of 1572. Tim Willocks is a novelist, screenwriter and producer. Translated into twenty languages, his novels include The Religion, Bad City Blues, Green River Rising and Twelve Children of Paris. He has worked with major Hollywood directors, dined at the White House and holds a black belt in Shotokan karate.